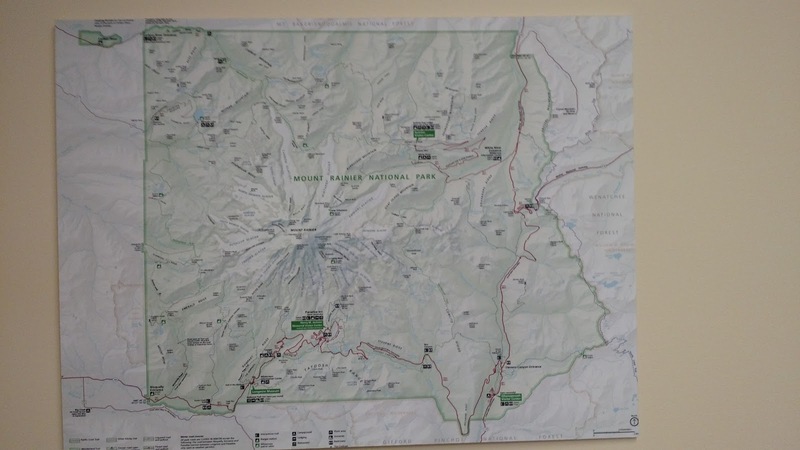 So we come to the final installment of this one, two, three, four part story of the Turning Fifty/Wonderland Trail/will the hike be as long as these posts journey. As mentioned before, I was pretty jazzed about this trip. I read books, attended an REI presentation, researched gear, and blew up a map of the trail to hang on my office wall. Whenever I felt buried in taxes, I would look up at that map like it was a literal window to the outside. When April 1st rolled around, I would constantly check my email looking for the all critical message letting me know I would get in. The website mentioned that you had seven days to respond to the invitation, so after a couple of days I thought to check my junk folder as well. If Google had marked it as spam and I missed it, my head may have exploded. After a week or so, I logged onto the permit website and found this update. I had previously had good luck with lotteries. Well, not lotteries for money, just ones where you sign up for the opportunity to beat yourself up for pleasure. I lucked out on the first try to ride Ramrod in 2013, and "won" again for the chance to run the St. George Marathon in 2016. The above notice told me the odds weren't looking good for a third round of luck. 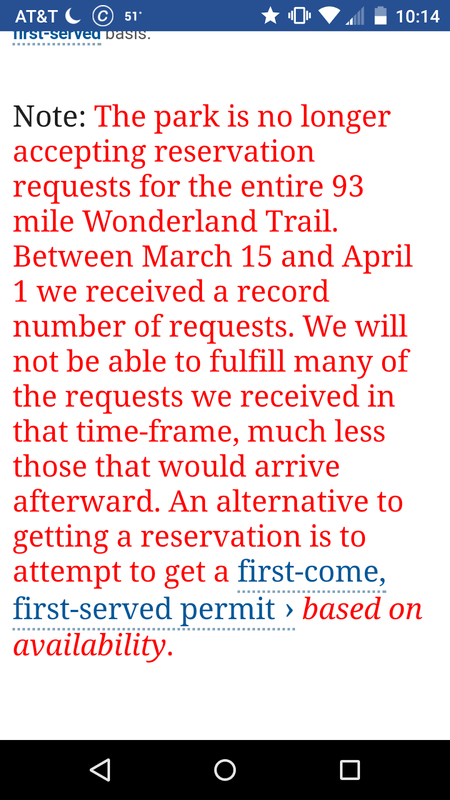 I kept refreshing my email inbox at unhealthy intervals, but consoled myself that if I had to, I would go the first-come, first-served permit route for the few reservations they set aside each year. Work is a bit more flexible in the summer, so I figured I would drive down to the park, see if I could get in, and if not, go back to work for a couple of days. Then I would drive down again, rinse and repeat until I could get my foot in the door/on the trail. Then I got the email denying me a permit. I was pretty disappointed. I had really built this trip up in my mind to the point to where I was almost depending on it. I sort of sulked for a few weeks, wondering how realistic the day-of approach to getting a permit would be. 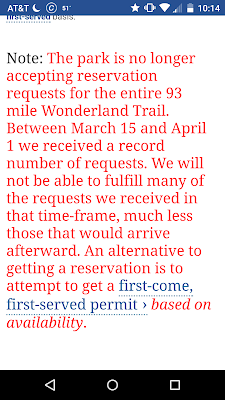 At some point, I logged back onto the permit website and found this new update. I am not sure how "a large number of the camps are now full on the entire circuit through the end of September" happens when they say they hold back 30% of the reservations, but whatever. This note made it pretty clear that I would not be hiking the Wonderland Trail in 2017. Having now made that decision (or having it made for me) it allows me to take summer plans off hold and hopefully get out on some shorter adventures. The ultimate goal was to get outside and disconnect - and I suppose reconnect with parts of myself set aside. Getting outside always refreshes my soul, and The Wonderland Trail would have brought this to another level. However, I need to learn to recharge my mental and physical batteries on a more daily basis. You can't depend on a two-week getaway to make up for an entire year. There is now an additional (great) complication that made an epic trip less feasible this year. Shifting gears, but to be continued again. "You can't depend on a two-week getaway to make up for an entire year."